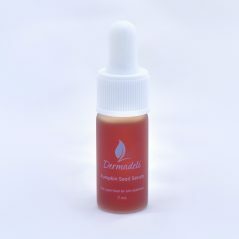 Welcome our Pumpkin Seed Serum 7 mL bottle. With all the same healthy skin benefits as our full-size, now in compact packaging. I’ve had adult acne for years. I’ve poured hundreds of dollars into products that claim they will work but nothing has- until this wonderful product right here. I honestly did not expect It to work. I thought at most It might help with dryness. However, after daily use for about a month, my skin has never been more clear. I will definitely continue to use this! I also got this in my Ipsy bag and LOVEEEE it!!! I used it and my face had been so clear, it wasn’t until I noticed it was from this serum until I switched to a different night cream (the Image Vital C Hydrating cream) and noticed my breakouts were back! I have now switched back, to the pumpkin seed serum and my face is clear and radiant again!! This stuff is magic!!! This stuff is amazing! I received this as a sample in my Ipsy bag and while I wasn’t completely sure I would like this serum (I was scared it would make my face oily), I am completely in love! My forehead has little wrinkles on it from expression lines and after a week of using this product those lines started to diminish. By the end of the bottle it looked like I had gotten Botox on the middle of my eyebrows and upward to the center of my forehead. I haven’t used it since I ran out and my skin is definitely showing a difference (negatively). Definitely buying this product, my skin misses it! Received in my ipsy bag last month, just purchased a full size minutes ago. I don’t think I’ve ever been so surprised with a skincare product! It’s not only magic for dry skin, but any blemishes (adult hormonal acne) disappeared almost overnight! I’ve never seen such great results, usually anything that helps my dryness will clog pores or break me out ….love that this is so multidimensional. I love the ingredient list is so small but jam packed with great stuff! Now I just hope this product doesn’t ever go away, cause I’m hooked! I also received in my Ispy bag and fell in love. I have super dry skin and this worked so great. You only need a small amount! I just placed my first order and can’t wait to receive it and I am excited to try their other products. I purchased this oil after reading the reviews and seeing thatgirlshaexo rave about it on YouTube. I was pretty excited to receive it. I figured it would be perfect for my dry skin and acne, but honestly it did not do anything for my skin! It’s a nice scent and texture. I feel like it added a slight bit of moisture, but the overall appearance of my skin did not improve. I then switched to my bio oil and tried to see if that worked, and it did. My acne is almost clear after using it again on my face! I recommend going out and buying the bio oil, for you’ll save money on shipping and whatnot. I’m glad they have the option to purchase the 7mL bottle though. That’s pretty great! LOVE, LOVE, LOVE! My bronzer, etc goes on smoother. I love that I dont have to buy an entire line to get this to work. I just use the serum and that’s all I need. I can’t say enough about this serum! It definitely hydrates my dry skin but most of all, I have instantly noticed that my fine lines fade right before my eyes! I haven’t tried a better product than this! Thank you for making this and for saving my aging skin! Also had this in my ipsy bag!! It is amazing… and the only thing that has worked to help get rid of my chronic dry skin, & any trace of acne! I use it before I put on my make up and before bed … not greasy at all! I also am allergic to most lotions and facial cleansers and this did not bother my skin at all <3 thank you!!! I don’t know how, I don’t know why, but this serum has cleared my chronic acne almost entirely. I got a sample in my ipsy bag and am massively impressed with the results. Works better than anything I have attempted to use in the past, including topical prescriptions. I got this in my Ipsy bag and I’m *in love* with it!!!! It’s perfect for before I put makeup on and before I go to bed. It doesn’t leave my face feeling greasy at all but feels soooOoooooooo moisturizing!!! I also received this product in my ipsy bag! I have super dry skin and this serum has saved my life!! Definitely buying a full size as soon as I run out as well as checking out some more products! Soooo amazing! Is at day or night? Hi! It’s really up to you and when you feel your skin needs the most hydration. Day – make up glides on more smoothly. Night – skin hydrates without any environmental interference. Thank you for your question. I got this in my Ipsy bag and after using it only a few days I’m in love! It improved my dryness, fine lines, and pigmentation and hasn’t broken out my skin! Wish it was sold in a larger quantity!! So impressed with this product!! I was very impressed with the results after only a few days. My skin was softer and less irritated. I highly recommend this product!